The Central Alaskan Yupik language apparently has 15 words to describe snow (not 32, as legend goes). German has a single word that means “the satisfaction felt at seeing or hearing about the misfortune of others”. And Yiddish speakers, when they want to let you know that you’re driving them crazy, will tell you to stop banging on a tea kettle. The notion that language mirrors the way its native speakers view their world goes back at least as far as ancient Greece. In the last century, though, the principle of linguistic relativity, as it’s called, gained considerable traction with the development of the Sapir–Whorf hypothesis, or Whorfianism. Named after American linguists Edward Sapir and Benjamin Lee Whorf who, it’s interesting to note, never co-authored anything, much less stated their ideas in terms of a hypothesis, Whorfianism (in its so-called “strong” version) states that language determines thought. These days, this version doesn’t hold much confidence and the common position now is that while language does influence cognition, it is not the sole determinant. In 1998, American science-fiction writer Ted Chiang (姜峯楠) published a short story that applied the Sapir-Whorf hypothesis to an alien encounter. Just eight pages in length, “Story of Your Life” became the seed for the 2016 film, ARRIVAL, starring Amy Adams (AMERICAN HUSTLE; HER), Jeremy Renner (Marvel AVENGERS franchise), Forest Whitaker (LEE DANIELS’ THE BUTLER) and Michael Stuhlbarg (TRUMBO; STEVE JOBS). In the film, Adams plays Dr. Louise Banks, a linguistics professor at an unnamed American university. Through a quick succession of flashbacks we learn that she had a daughter who died of cancer far too young. Louise’s husband is nowhere to be seen. One day, while lecturing to her students, 12 alien spacecraft – each looking like the top half of a slate grey hamburger bun – arrive to Earth and position themselves around the planet, from Venezuela to Pakistan, Greenland to Australia. They immediately start broadcasting messages to the world but no one can understand what they are saying. With one such ship hovering over an open plain in Montana, Banks, along with theoretical physicist Ian Donnelly (played by Renner), is brought in by U.S. Army Col. Weber (Whitaker) to decipher the aliens’ language and determine their motives before chaos erupts all around and the Earth is thrown into intergalactic war. 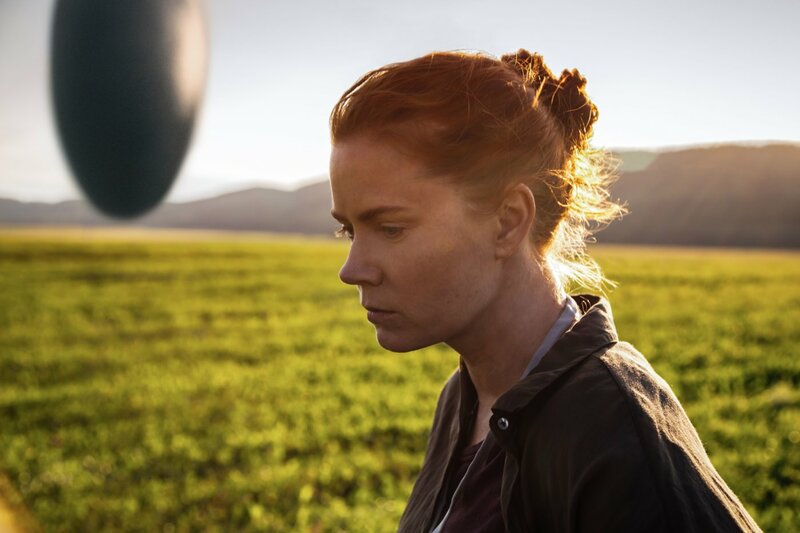 Without a doubt, ARRIVAL is the most cerebral film Hollywood has come out with in quite some time and, when the lights come up in the cinema, if you’re not turning to the person next to you and asking them to explain their interpretation of the ending, there’s something wrong with you. That’s not to say that the film is confusing or that it has so many twists and surprises that you don’t know day from night. On the contrary. The story is laid out ever so methodically, like a poker player who reveals his hand one card at a time. But the story of the professor who learns how to communicate with aliens, and what they teach her, is mind-bending, if not mind-blowing, to say the least. Director Denis Villeneuve (SICARIO) does a superb job bringing this wondrous story to life. Wisely, he avoids going down the road of using excessive CGI and massive explosions that doomed another recent sci-fi film, PASSENGERS, preferring instead to put the focus squarely on Banks, expanding on her personal journey as she unravels the mystery of the aliens’ language. He will probably receive an Oscar® nomination for his efforts – and rightly deserved if he does – though I doubt he’ll be taking home the golden statuette on February 26th. The competition is strong. Adams should also receive a nomination – also deserved – and she may win. This is really her movie as all the other actors are like bees buzzing around her flower. There aren’t too many movies that I want to watch again right away but this is one of them. ARRIVAL is one of my favourites for 2016!